Stairway, staircase, stairwell, flight of stairs or simply stairs are names for a construction designed to bridge a large [] distance by dividing it into smaller vertical distances, called steps. Stairways may be straight, round, or may consist of two or more straight pieces connected at angles.Special stairways include escalators and ladders. Alternatives to stairways are elevators, stairlifts and inclined moving sidewalks as well as stationary inclined sidewalks. Stairways can be constructed by modified tensegrity mast or tower. Harp Stair by Grimshaw Architects. See text for details." 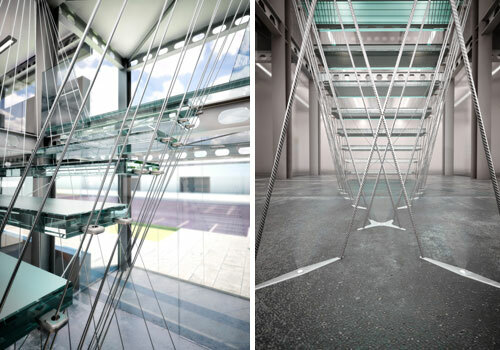 link http://continuingeducation.construction.com/article.php?L=5&C=674&P=4"
In the image above by Grimshaw Architects, on the left you see prestressed cables running from the floor to the castellated steel beams overhead carry the glass treads. On the right, a fish-bow truss beneath the treads provides lateral stability. This page was last edited on 18 January 2019, at 07:57.